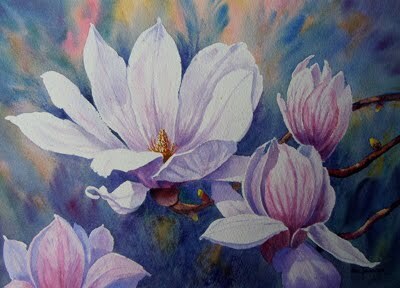 Magnolias are so beautiful and it is hard to resist painting them. This watercolour is now showing at The Capital, View Street, Bendigo and one of three paintings of mine on show at the present time. My works are a part of the exhibition called "Six Bendigo Artists" and will be there until 25th. March, 2011. Admission is free to view the works. This watercolour is priced at $495.00 and purchases can be made from the friendly staff at The Capital.